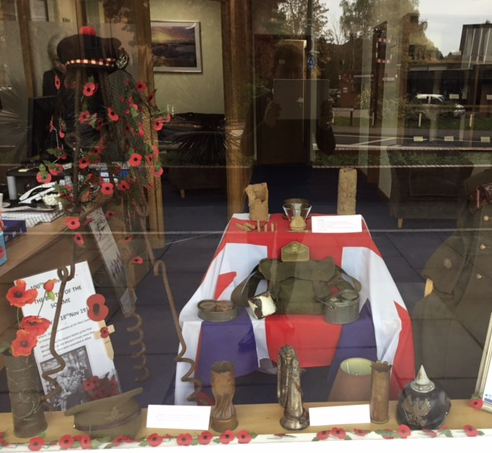 Susan Areington and Lodge Brothers are very grateful to Neville and Janette Lazenby again this year, for the generous contribution of their time, and for the articles on loan displayed in the Woking branch window this remembrance day. Mr Lazenby offers his time to create the display to thank Lodge Brothers Funeral Directors of Goldsworth Road, for the way they looked after his son Steven after he died of a brain tumour in January 2012. Neville and his wife Janette have remained in contact with Lodge Brothers since arranging their son’s funeral. Also remembered is Sergeant Ralph Lazenby (Neville’s father) who was an original member of the SAS in 1941 and Woking resident Walter ‘Charlie’ Brown OBE, who died in 2010.